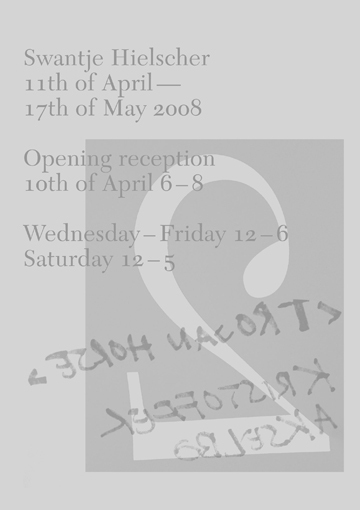 BolteLang’s second exhibition opens on the 10th of April 2008. It continues the gallery’s series of two-person shows with a presentation of works by Kristoffer Akselbo and Swantje Hielscher. This structure allows for any number of different exhibition formats. Thus it came about that this exhibition is the presentation of a friendly rivalry, a joint enterprise that clearly shows the artists’ different strategies for occupying the Limmatstrasse space. The exhibition has two titles: Swantje Hielscher’s and Trojan Horse for Kristoffer Akselbo. Kristoffer Akselbo (b. 1974) is a Danish artist based in Copenhagen, where he studied at the Royal Danish Academy. He has gained significant recognition for his mechanical works, often appropriating everyday objects and transforming their purposes and meaning. Humour and a ready reference to pop culture are evident in his works, but his chosen title for this exhibition, Trojan Horse, alludes that the pieces may hide a second meaning, and all is not what it first seems. Several works will be static; rather than fully realising each idea’s trajectory, Akselbo invites the viewer’s input to complete them. To create the work Imagine..it ́s the surreal thing he proposes positioning four tabs of LSD, a drug first synthesized in Basel in 1938 by the researcher Dr Albert Hoffman, as if they are the remaining fragments of a poster image that has been ripped away; the viewer can fill the void with a pin-up, idol or fantasy of their own imagining. German artist Swantje Hielscher (b. 1980) investigates the essence of things. Her practise is led by a conscious discipline, a quest for balance within contradictory dualisms – such as the difference between a glance and a gaze, or mechanised processes and manual craft. Working in sculpture, installation and on paper, she considers the perception of each object and often explores disregarded spaces between consciousness and comprehension, as well as between the subjective and the commonly used valuations of material, measure and place. Swantje Hielscher disrupts the viewer’s habits to play with undiscovered interstitial spaces between picture and language, reading and seeing. One series of prints Release which from a distance appear to be typed letters reveal themselves to be a list of colours with evocative names coveringthe spectrum from white through a gamut of shades to black. The viewer’s anticipation of narrative is thwarted, replaced by a still enunciation of a vibrant kaleidoscope, which allows for a sensual experience of the visual void. BolteLang invited Kristoffer Akselbo and Swantje Hielscher to work together, as although they have little in common in terms of style and method, they share the ability to visualise poetry in the mundane and its abstraction. As well as their curiosity about the meaning of things, both artists play with the boundaries of dimension, whether between 2 and 3D in Swantje Hielscher’s works, or when Kristoffer Akselbo investigates where form becomes movement. Having not met face to face prior to the exhibition, the artists’ distinct approaches and responses to each other’s works perceived within the frame of electronic communication have initiated the curatorial equivalent of a game of chess – as the artists read each other’s signals, negotiate and manoeuvre, the exhibition takes form.